First – let’s ‘review’ that RESONANCE of the antenna element(s) is a CRUCIAL factor for efficient transfer of RF energy. Let’s also ‘review’ that current in one part of a circuit (starting at the source, equal at the load) must/will equal the current returning from the load, getting back to the source. The key to all of this is helping ensure that the current flows in the right places. If it’s not in the right parts of the antenna, if those right parts do not exist, the antenna is less-effective in some aspects. It IS possible and all too common for the source and return currents at the transmitter to NOT be equal to the source and return currents at the antenna. “At the antenna” IS important! Perhaps THE most important as the antenna is and should be our ONLY RF coupling mechanism to the outside world. RF going anyplace is is not what we want. The answers are quick and obvious – space, and cost. To that we can all tell you that ‘cost’, at least of wire, is not that significant, at least in terms of wire. ‘Space’ on the other hand covers a lot of ground – pun sort of intended, but not. ‘Space’ covers length, height and exposure. Certainly if you live is a desolate, ‘desert’ area amid an area you are not allowed to expose anything but a prescribed house structure, any wire or pole could violate local restrictions. Antennas don’t look like shutters, shingles, windows, doors, etc. nor are they typically the ‘right’ color to suit the ‘feel’ of a community. Second to the above is that you might have a 30×60 lot, be able to expose a gawky “TV antenna” or ‘dish, and a singular wire might be benign/’OK’ but a balanced dipole with a center insulator or balun ‘blob’ might be a challenge a visual insult. We all ‘get’ that there are compromised conditions, and for those situations compromised antennas can be a ‘given’, but if you do not have “compromised conditions” there are few if any reasons to impose on yourself or insist on a compromised antenna because it ‘sounds’ cool, ‘great’, etc. Worse, that when a compromised antenna might not perform as you want or when it may cause more problems than you should have to deal with. “The price of quality only hurts once.” When it comes to wires, ‘price’ is not really about cents-per-foot for a spool of 14 gauge, but the ‘cost’ of mitigating issues with how that wire is deployed. End-feds, off-center-feds, ‘Zepps’, etc. are specifically compromised, technically (factually) inadequate, compromised antennas. We know this from Kirchoff’s law (prior offering), simulation and network analysis, antenna patterns, stray RF effects, etc. This is a given, an absolute, a scientific known certainty. If you are not a half-wave dipole or a properly counterpoised 1/4-wave vertical/ground-plane, or engineered directional antenna, you are probably not a well-known proper antenna. We’re just discussing electrical facts here, NOT “you have a lousy signal” or “you’re a bad ham…” – seriously?! Let’s dial-back to the ‘Zepp’ days… first, a ‘Zepp’… well, actually Heir Zeppelin, is the German who created a large lighter-than-air flying craft – NOT an antenna, NOT ANYTHING related to radio. The “end-fed Zeppelin antenna” was ‘crafted’ by some unknown person back in the 30s (?) as some thing to dangle behind a big balloon. How or why said unknown person did not cast a resonant long-wire and provide a counter-poise amid the vast metal framework of the flying craft ala Marconi or other style no one knows. That’s the HUGE mysterious variable among many things radio before most anyone, everyone knew ANYTHING radio pre- or post-WW2. All that most anyone knew about radio “back then” is something about RF current and they “got out”. That had been the basis of most RF knowledge well into the 1960s unless you were involved in advanced “top secret” research around VHF and UHF radar, etc. with the likes of the Varian brothers, Raytheon, Texas Instruments, Harris, Lockheed, Northrop-Grumman, etc. Since high-tech military research, computers, the Interwebs, etc. we now have 20+ years of reality of illustration and proof of what works, and what sort-of-works amid various antenna constructs – in terms of electrical laws/performance, RF energy patterns, and quite likely RF energy ‘interference’ or distortion = stray RF = RF interference. A radiating element without an equal, opposite, known RF current return path is disruptive, problematic. First, you’re applying voltage (NOT POWER) to one element and hoping it results in current flow and then power transfer radiated to another distant station. If there is NOT a RESONANT, equal, opposite, other-half of the antenna for the current to return through – where is the current from that applied voltage going? To an effective part of an antenna that is optimal for radio contact, or elsewhere? Where is the resulting power radiated to? Into the air in a known desired direction to make contacts or onto the coax shield, your electrical system, the neighbor’s TV antenna, phone lines? THIS is the very dilemma and question – the very concern relative to stray RF, RFI, etc. In the case of the ‘Zepp’ or OCF – you can expect that the return RF current path is unpredictable and only convenient to whatever is proximate and most suitable for the frequency of operation. You or your neighbor might not experience RFI on 15 meters but a lot on 20 or 40. Chokes here or there MIGHT resolve one symptom or the other but do NOT correct the very PROBLEM that is created and obvious because of a “non-balanced” antenna scheme. Indeed, OCFs and “end-feds” (‘Zepps’, j-poles, slim-jims, et al) are close cousins on related twigs on the outlying family tree branches of non-self-contained antenna constructs. W8JI and others cover this quite in-depth. We experience similar conditions running HF mobile – where most/all vehicles are quite inadequate to act as full proper counterpoise for end-fed HF mobile whips. The take-away is – obey the law, Kirchoff’s!! 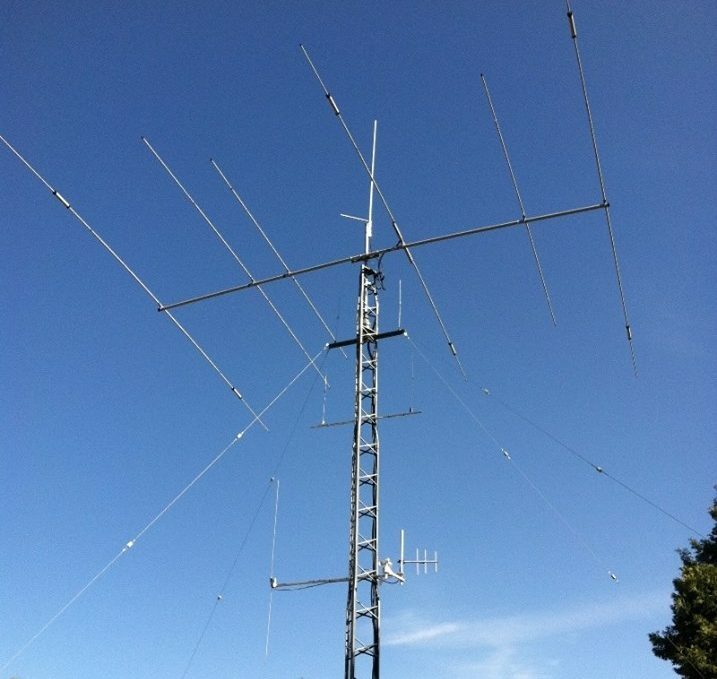 If you have a choice and opportunity – choose the half-wave dipole, the resonant 1/4-wave vertical with proper counterpoise, over any variant of ‘unbalanced’ antenna construct.